Feb 2018 (Washington DC, USA): Punjab Skills Development Fund (PSDF) and Generation have joined forces to address the challenges facing young people who are seeking to connect with the job market. Together, the two leading organizations will bring a proven, innovative model—the Generation program—to Pakistan. “PSDF has developed a strong reputation for delivering skills programs guided by evidence on what works. We are now partnering with Generation, a world-renowned nonprofit, to incorporate proven international experience into our training programs to raise the productivity of firms across Punjab,” said Dr. Ijaz Nabi, Chairman PSDF. 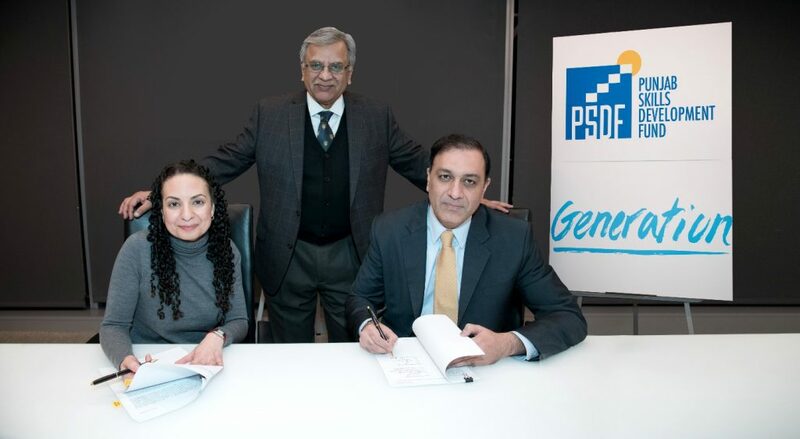 From left to right: Dr. Mona Mourshed, President and CEO of Generation, Dr. Ijaz Nabi, Chairman PSDF and Mr. Jawad Khan, CEO PSDF at the contract signing ceremony. Punjab Skills Development Fund (PSDF) is a section 42 not-for-profit company established in 2010 under the Companies Ordinance 1984 by the Government of the Punjab in partnership with the UK’s Department for International Development (DFID, UK). The World Bank is also providing funds to the Punjab Government for the trainings to be funded by PSDF. PSDF aims to provide quality skills and vocational training opportunities to the poor and vulnerable populations of all the 36 districts of Punjab in order to improve livelihood prospects for them. Since its establishment in 2011, PSDF has trained 250,000 youth in over 200 trades and it works with over 250 private & public sector training providers. Over the next 5 years, it will be training over 400,000 youth across Punjab that will be employed in Pakistan and abroad. Today, more than 75 million young adults are out of work globally, and three times as many are underemployed. At the same time, 40 percent of employers say a skills shortage is leaving them with entry-level vacancies. Generation is a youth employment nonprofit with a dual mission to empower young people to build thriving, sustainable careers and to provide employers the highly skilled, motivated talent they need. The first active programs have been in India, Kenya, Mexico, Spain, and the US, and Generation is launching in the United Kingdom, Hong Kong, and Pakistan to start 2018. The organization was founded by McKinsey & Company in 2014.